Wuon-Gean Ho graduated in History of Art from Cambridge University, before taking up a Japanese Government Scholarship in 1998 to study traditional woodblock printmaking in Kyoto. 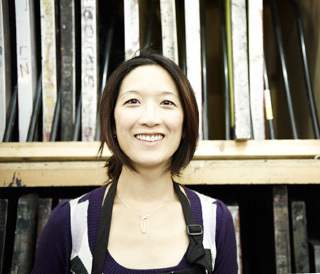 She makes prints, artist’s books and animations, and is based in London. She has undertaken artist residencies in the UK and abroad, including Caldera Arts Center, Crow’s Shadow Institute of the Arts and the Sitka Center for Arts and Ecology in the USA; the Bluecoat Arts Centre and Aberystwyth School of Art in the UK, and the castle of Montefiore Conca in Italy. She is studying printmaking at the Royal College of Art (2013-16) and works as news editor for the UK based magazine Printmaking Today (from 2013). She is the recipient of awards including the John Purcell Paper prize in 2007; the Printmakers’ Council prize in 2009; and the Birgit Skiöld Memorial Trust Award of Excellence in 2010. In 2014 she was awarded first prize in the book competition, Books of Desire, Ravenna, Italy, and the British Institution Award at the Royal Academy Summer show, London. Public commissions include a series of lunar calendar coins for the UK Royal Mint from 2014-2026.